Cobalt, the largest airline in Cyprus, has collapsed — after failing to reach a deal with a potential European investor, following the decision of its Chinese majority investor to suspend its investment in the airline. If You Were Booked To Fly Cobalt: Do not travel to the airport expecting a Cobalt flight, or expecting any arrangements to be made by Cobalt. The airline has now collapsed and ceased all operations. Passengers will need to make their own arrangements, and your first point of call should be your travel insurer, as most policies cover airline collapse. Passengers who booked directly with Cobalt Air using a credit or debit card may be able to make a claim against their card provider — another reason why it’s always safer to book flights using a credit card. Cobalt is not covered by the Civil Aviation Authority’s ATOL Protection scheme which only covers passengers booked on a package holiday. This means that if passengers are booked on a Cobalt flight to return to the UK, there will not be any ‘rescue operation’ flights, unlike the collapse of Monarch Airlines last year, which triggered the UK’s biggest peacetime repatriation, where passengers were flown home on specially chartered airline jets. Blue Air is offering rescue fares from Larnaca to and from Athens, Thessaloniki and London for Cobalt Customers. Between October and March, Blue Air is offering rescue fares on Larnaca – Athens, Thessaloniki – Larnaca, Larnaca – Thessaloniki, Athens – Larnaca, London (Luton) – Larnaca and Larnaca – London (Luton) routes. The fares are 69 EUR, one way, to/ from Athens and Thessaloniki, or starting from 99 EUR, one way, to/from London Luton. Passengers in possession of a cancelled Cobalt flight reservation between Larnaca and Athens, Thessaloniki and/or London(Luton) can book the reduced fare by calling Blue Air call centre at 0151 230 1590. Cypriot media reported earlier that the company had only €15 million its accounts, which it will use to pay Cobalt employees. Cobalt served multiple destinations from its Larnaca hub, including London, Paris, Madrid and Dublin. It also flew to Abu Dhabi and codeshared with UAE flag carrier, Etihad Airways. The airline, which was backed by Chinese investors, managed to secure daily slots at London Heathrow Airport — something extraordinary for a small carrier. Obtaining slots at Heathrow is incredibly difficult, both because of the extensive waiting list of the world’s airlines who want to add frequencies at the airport and because of the enormous cost involved in purchasing. Not too long ago, Muscat-based Oman Air purchased slots at Heathrow for a huge $75 million. Cobalt was an Airbus operator and flew six A320 family aircraft. The carrier offers passengers a genuine, dedicated Business Class cabin (with actual Business Class seats) — something very unusual in Europe. 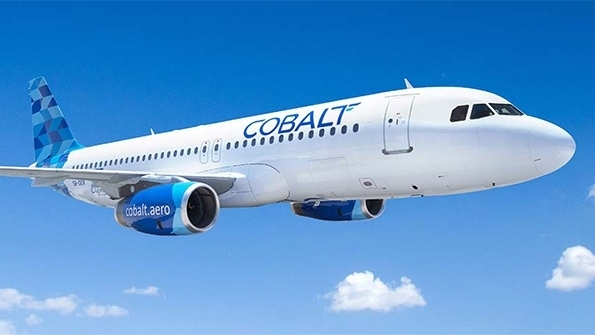 Earlier this month, rumours began circulating that the airline was facing cash-flow problems, and reports surfaced that Cobalt had not paid the monthly leasing fee to an American lessor which owns two aircraft. Sources within the company told Cypriot media that the liquidity problems are due to Chinese investors (the largest investor in Cobalt) suspending future investment, amid China’s own recent trade war with the US. Cobalt employed around 200 people and stepped in to replace bankrupt national carrier, Cyprus Airways, which ceased operations in January 2015.